Mutualisms (e.g. Figures 10.3, 10.4) are those interactions in which both partners accrue increased fitness relative to individuals that do not engage in it. How might selection favour the expression of traits that help other individuals of a different species, given a prior relationship that was more nearly neutral or even antagonistic? Frank (1997) has suggested that two processes act to help the spread of such traits: first, an initially high level of expression on first meeting in both partners. Second, spatial association between pairs of individuals with positive synergism so that benefits can be returned to the donor (see also Yamamura etal. 2004). Imagine that when two species first meet, both species possess a trait that provides a small benefit to another species at some cost to itself. If these benefits are below a threshold value, selection will favour lowering expression of the trait, such that a mutualism does not arise (Frank 1997). But if the expression of the trait is above a certain threshold, the synergistic effects between species can push expression of the trait to an equilibrium at higher levels of expression. If the benefits of the traits are high relative to the costs, the threshold value is lower and the equilibrium value higher. Fig. 10.3 A plant-mycorrhizal symbiosis. The picture shows a root of Plantago lanceolata, with the fungus Glomus hoi (stained dark) growing through it. The dark blob (50 pm across) is a vesicle, thought to be a storage organ for the fungus. The fainter rectangular structure to the right of the vesicle is an arbuscule, believed to be the site of nutrient exchange between the fungus and the plant. Photo courtesy of Angela Hodge. example, aphids pass their mutualistic bacteria, Buchnera (Figure 10.4), from mother to embryo (vertical transmission). 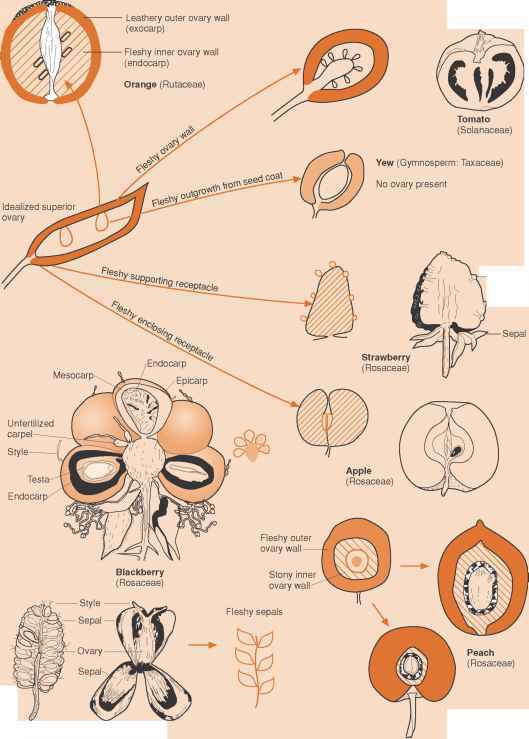 Mitochondria and chloroplasts are also transmitted vertically through gamete cytoplasm (Figure 10.2). Spatial binding of a different nature occurs between genes in a genome via linkage, and that contributes towards cooperation between genes in a cell. These latter examples illustrate that mutualism has occurred not just between what we now think of as different species, but that it was involved in the major transitions leading to modern species (Chapter 2). In many cases, the theory relevant to interspecies mutualisms has developed from thinking about these major transitions (see Maynard Smith and Szathmary 1995; Frank 1997). Fig. 10.4 Cells of the symbiotic bacterium Buchnera, within the cytoplasm of a type of specialized cell, bacteriocytes, within the body cavity of the pea aphid, Acyrthosiphon pisum. The Buchnera are about 4 pm across. Buchnera are vertically transmitted and provide essential amino acids to the aphid which are absent from their diet of plant sap. Photo courtesy of Angela Douglas. exploiter-victim relationship (Figure 10.5). The model specifies a mortality cost to the victim in the free-living state of reducing the amount of resource donated to the exploiter in the symbiotic state. With no such cost the symbiosis breaks down: victims reduce their flow of resources to their exploiters until the species no longer interact. When the cost is sufficiently high, however, there is selection on both parties to increase the degree of coupled replication until this is the sole form of reproduction, despite the fact that one species continues to exploit the other. Such a system is one of mutual dependence, since both species now do better inside than outside the relationship, despite the fact that only one species transfers resources to the other. 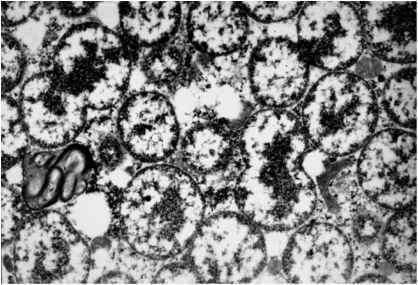 An experiment by Jeon (1972), involving amoebae and a parasitic bacterium, has shown the evolution of such mutual dependence in the presence of a viability cost to the amoeba in the free-living state, and despite the fact that that viability of the amoeba was no higher in symbiosis than before. Fig. 10.5 The merger of lineages through exploitation. In stage (a), two species coexist, and one (large circle) occasionally exploits the other (black circle, arrows show flow of resources) in a symbiosis. However, the symbiont can also occur in the free-living state. In stage (b), the symbiont develops defenses (D) that stem the flow of resource to the host somewhat (shorter arrows). In stage (c), the free-living form of the symbiont becomes extinct because of the cost of defences in the free-living state, giving rise to a permanent exploitative symbiosis. Fig. 10.6 The Prisoner's dilemma. Four possible interactions are shown, and the pay-off to you in arbitrary fitness units. If the partner cooperates, it is best to defect (the temptation); if the partner defects, it is best to defect (the punishment) rather than cooperate (the sucker). Result: everyone always defects, cooperation is absent. without donating anything themselves. Theoretically, such a situation is a Prisoner's dilemma game (Figure 10.6), in which for each party it is best to defect whether the partner cooperates or defects. Thus, the Prisoner's dilemma becomes a trap in which cooperation cannot be a stable outcome. Indeed, there is considerable evidence that cheating is a common, though not exclusive outcome of mutualistic relationships. For example, many insects rob flowers of nectar without affecting pollination. The surprise is not that such cheaters exist, but that some mutualisms have survived for a long time without being destroyed by such processes—the relationship between figs and their pollinating wasps, between corals and algae, between mycorhizal fungi and terrestrial plants are all ancient. What maintains such mutualisms? One possible answer is once again vertical transmission. Clearly, however, there are still many mutualisms that are not transmitted vertically. These include mycorrhizal associations (Figure 10.3), the rhizobia bacteria of legumes, pollination interactions (Figure 10.7), seed dispersal interactions, most gut floral associations, and cleaner associations. Many of these interactions also involve multi-species associations, which are again predicted to favour exploitation of the mutualistic partner. Clearly, there must be additional mechanisms at work that can maintain the stability of cooperation across species (Wilkinson and Sherratt 2001). There are several theoretical possibilities, but with somewhat limited supporting evidence at present. One possible mechanism that might maintain the stability of a mutualism is if the beneficial donations are not costly to the donor. In fact, many mutualists donate products, or by-products,that are available in excess or are not limiting to them: for example, plants donate carbon, which is normally not a limiting nutrient, both to their mycorrhizal fungi and to their pollinators in the form of nectar. Lack of costs means that mutualists are playing a game more closely akin to 'nice guys win' in which it pays both partners to cooperate even in the short term because defection does not increase pay-offs. Another potential stabilizing factor is if the partners can retaliate to defection (sanctions). Under such conditions, the decision to cooperate or defect can be made conditional on the previous actions of the other partner. It is then relatively easy to generate conditions under which persistent cooperation is the stable outcome because the lifetime pay-off, as opposed to the short-term pay-off, is now greater if organisms do not purely defect (Maynard Smith and Szathmary 1995; Wilkinson and Sheratt 2001). One example comes from the Yucca—Yucca moth pollination mutualism (Figure 10.7). Here the pollinating moth also consumes some of the Yucca seeds. In cases where a larger number of the seeds are being consumed, some Yucca species are able to selectively abort those developing fruits (Pellmyr and Huth 1994). In this case therefore, the cost of overexploitation is paid by the moth's offspring, but that is just as effective a mechanism of selection. Fig. 10.7 Two moths, Tegeticula yuccasella, in a yucca flower. The moth on the left is pollinating the flower, while the one on the right is laying its eggs at the base of the flower. Fruits infested with many moth larvae are more likely to be aborted by the plant, a mechanism that may help to maintain the mutualism by prevention of cheating. Photo courtesy of Olle Pellmyr. Sanctions have recently also been demonstrated in the Rhizobium/legume mutualism and may help maintain it there in the absence of some other forces, such as vertical transmission (Kiers et al. 2003). In this case, the legume appears to withhold oxygen from root nodules containing 'cheating' bacteria that are not providing sufficient nitrogen to the plant. Control over mixing also occurs via uniparental inheritance of organelles (Chapter 2), and via the unicellular zygote stage through which all multicellular organisms pass during their life cycle, which contributes to the stability of the body. Another form of control that selects against symbiont exploitation is reproductive fairness (Frank 1997). In meiosis and mitosis the replication of the chromosomes is rigidly controlled such that each has parity with others and an equal chance of being present in the next generation. Under such rigid control the only way that a chromosome can increase its own success is to work for the benefit of the group (the genome). In some insects that play host to symbionts, rigid control of which symbionts are transmitted to the next generation also occurs. In the sucking louse Haematopus, symbionts are separated early in development into a 'somatic' group which never enter the next generation and are involved in the gut symbiosis, and a 'germ' line which are destined to enter the next generation (Buchner 1965). Again, the somatic group can only increase its own success by working for the benefit of the group. A final way to enforce control is via a policing strategy that directly combats cheats. 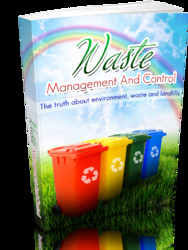 This occurs in the case of mitochondrial cheats that cause cytoplasmic male sterility in plants (Chapter 5) and whose effects are countered in some strains by nuclear genes. Finally, while the evolution of cheating may sometimes lead to dissolution of an interaction, or extinction of species, another possible outcome is stable coexistence of cheater and mutualist. In fact stable coexistence is known from many systems, such as the yucca/yucca-moth system, and figs and fig wasps, both of which are host to non-pollinating insects. Ferriere et al. (2002) have used an adaptive dynamics model (Chapter 8) to investigate this possibility, assuming that symbionts compete for the resources received in the relationship in an asymmetric way such that mutant individuals are either more or less successful than residents under competition. They find that under certain conditions, evolutionary branching can occur, leading to the stable coexistence of a cheating and more mutualistic species. Thus, a number of conditions may favour the origin and stability of mutualistic relationships, some of which are consistent with empirical data, albeit mostly anecdotal. The challenge is now to begin to test these ideas more rigidly. In addition, that further theoretical and empirical research may uncover additional alternative mechanisms for maintaining the stability of cooperation between species. The next few years should be exciting in terms of furthering our understanding. Our discussion of the evolution of species interactions in the last two chapters has largely considered only one partner in the relationship evolving at a time. Obviously though, and especially in intimate or obligate associations, each partner can serve as a selection pressure for the other. Such 'co-evolution' can then potentially lead to outcomes that differ markedly from the consideration of only a single evolving species. Co-evolution will be the subject of the next chapter.